Brief Synopsis – A documentary about how Steve McQueen made the film of his dreams despite many pitfalls along the way. My Take on it – After finishing to watch all of the films that Steve McQueen starred in, I came across this documentary that tries to explain what happened when he chose to merge his two favorite pastimes; movies and auto racing. I actually saw the film Le Mans (1971) a few weeks ago and despite it being visually stunning, I was quite put off by the lack of a story. 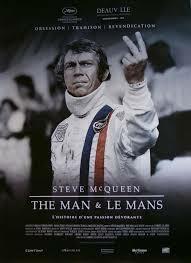 This film gives us the viewpoint of McQueen himself as he tried to get that movie made despite constant uphill battles. I loved the way that this film doesn’t try to shy away from the truth at all and we even get to see some of the interviewees become quite uncomfortable in their chairs when asked certain questions. In addition to explaining how the film got made, this film gives us so much insight into the personality and character of its star who happened to be one of the most popular actors of the 60’s. The way that this story is presented is quite informative and it even makes me appreciate the film Le Mans (1971) more after having watched this despite the fact that it doesn’t really change the way I feel about the film itself. McQueen attempted making a racing film where the viewer could feel the adrenaline of being in a race without having to deal with the risk and danger of it all. It actually works in some instances but overall, the fact that the film doesn’t have much of a story still screams out as a problem. I’m glad I saw this film because it helped me understand what McQueen was trying to do even if I don’t think he managed to achieve his goal fully. Bottom Line – Great documentary especially due to the fact that it doesn’t try to shy away from or hide the truth about events discussed. We get amazing insider information about the way this film came to fruition but more importantly, we get true insight into the character and personality of one of the greatest actors from the 60’s. This documentary actually makes me appreciate more what was done in the filming of Le Mans (1971) even if it doesn’t really change the way I feel about the film itself. Recommended!